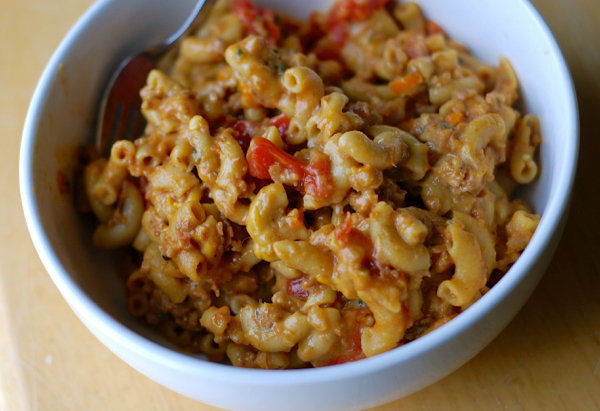 I am in love with one pot pasta meals and was so excited to create a recipe for vegan “hamburger” helper. It’s easy, delicious, comfort food that is SO much better for you than the original. No cholesterol! No preservatives! No chemicals! And alllllll the flavor! This is my vegan riff on the classic “cheeseburger hamburger helper.” Ohmygosh. SO excited to share this yummyness with you! Place crumbles, parsley, oregano, mustard, paprika, the JUICE from the can of tomatoes, onion powder, garlic powder, diced onion, diced bell pepper, veggie stock, milk, and macaroni in a large, heavy-bottomed soup pot or Dutch oven. Stir. Bring to boil. Lower to a simmer, and cook uncovered for 12 to 15 minutes, or until thickened and pasta is al dente/tender. Stir frequently during cooking process. Once done, stir in the diced tomatoes, cheese shreds, butter, and nutritional yeast. Mix well. Salt and pepper to taste.